While shot placement is a skill that must be learned, there is no better determination of stopping power than raw bullet energy. Winchester’s Ranger 110 grain 38 Special +P+ is the unequivocal solution to stopping most threats dead on their tracks. 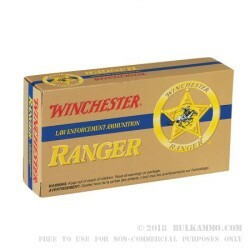 This Winchester Ranger 110 gr. 38 Special +P+ ammunition was originally developed for law enforcement and civilian personnel looking for a more reliable, more powerful solution to their duty, as well as self defensive needs. The 110 gr. fully jacketed hollow point bullet are powerful enough to punch through thick denim and nylon taffeta clothing, while still expanding and remaining with the temporal wound cavity. Transferring 100% of the bullets energy into the intended target. +P+ ammunition is loaded to higher pressures than a standard round in that caliber. So, keep in mind this particular Winchester 38 Special ammo is loaded hotter than what you might be used to shooting. Also, there are certain firearms that don’t recommend using the hotter loads in them. If you’re not sure, be sure to consult your firearm owner’s manual to make sure your pistol or revolver can handle these loads. Bullet velocities average an incredible 1,155 feet per second at the muzzle, and possess an incredible flat bullet trajectory relative to their inherent weight. If you are looking for a solid self defense round for your concealed carry revolver, the Winchester Ranger 110gr .38 Special +P+ may be just the perfect solution for you.